other is a common scene here. are all shot by the owner. No service charge. Credit cards not accepted. No minimum bills. 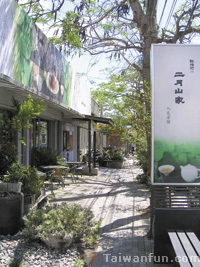 This vintage-style teahouse, featuring classical Chinese decor, sits on Guoji Street near TaiZhongGang (Taichung Port) Road. 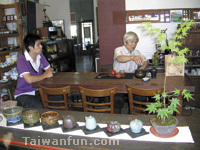 The owner is a photographer and very fond of Chinese tea culture, which means that many hard-to-find teas and pu'er tea can be found here. The owner's wife also loves teaching flower arranging and writing poetry. Thus, it's not surprising that many, if not most, of the patrons here look like they're also interested in art and literature. Left: The price range for coffees, teas and vinegar-based drinks runs from NT$40 to NT$200. For dining, the restaurant offers various set meals, Italian cuisine, hot pots and noodles (NT$110-500), and desserts fall into the NT$35-120 range. 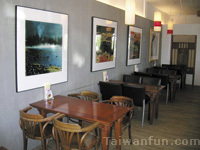 Larger groups of diners can also enjoy table set meals here. 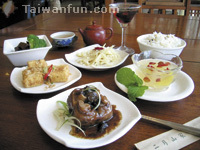 Tender Tofu, Betel Nut Flowers, Seasonal Vegetables, Handmade Pineapple Cake, and a pot of Huang Shan Da Shu Tea (or pitcher of juice). Besides the main entree, side dishes are not all listed on the menu, so you can anticipate some surprises. Betel nut flowers are rich in fiber and minerals, and taste crispy and refreshing when freshly stir-fried. The Beef Stew with Pu'er Tea is both healthy and tasty. 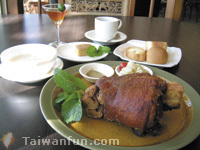 Only customers who order table set meals can enjoy these special dishes here. bread, dessert and tea or coffee.